Yet another guide from me and yet another visual novel with MAP trophy (SIC!). Fortunately this time the trophy popped as it supposed. This novel is very simple and straightforward. No mini games just MAP SELECTION between choices. At first I thought that for MAP SELECTION each choice I will show pictures of locations to choose but as most of the time you are presented with location to choose or you have to use to switch screens and there is one location to choose I stopped. Just follow the marks in top right corner and you will be good. Choices in this game are presented vertical so for the purpose of this guide we will mark choices from left to right. From MAIN MENU pick SECOND option from the left (チャプタージャンプ), choose Kintaro (second character from the right), then chapter 3 and LOW in the circle on the right. Confirm with right option twice. From MAIN MENU pick SECOND option from the left (チャプタージャンプ), choose Izumi Takahira (third character from the left), then chapter 3 and LOW in the circle on the right. Confirm with right option twice. From MAIN MENU pick SECOND option from the left (チャプタージャンプ), choose NAOMASA KATSURAGI (second character from the left), then chapter 3 and LOW in the circle on the right. Confirm with right option twice. From MAIN MENU pick SECOND option from the left (チャプタージャンプ), choose UMENOSUKE KAGA (first character from the left), then chapter 3 and LOW in the circle on the right. Confirm with right option twice. 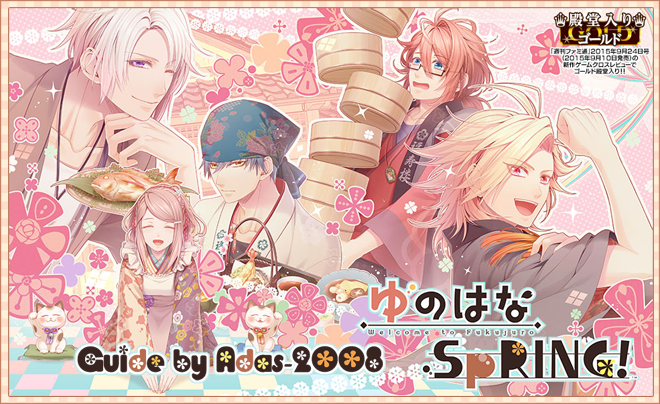 From MAIN MENU pick SECOND option from the left (チャプタージャンプ), choose KOTA SAEKI (fourth character from the left), then chapter 3 and LOW in the circle on the right. Confirm with right option twice. TOP LEFT PICTURE > FIRST OPTION FROM THE LEFT (it will be bonus scenario). Run it for all the characters. After that in the same menu go to RIGHT SIDE BIG PICTURE. Because there was one choice missing in japan guide I did KOTA route as last (trying to figure how to do it) so if you had / will follow jp guide your trophies popping order will be different. Hope someone will test it and confirm it is working. Excellent guide Adas, thank you. thank you Lukk - corrected! Thanks for the guide Adas. Thx for the guide, perfect. 2 and a half hours for me, though I was a little distracted. Perfect guide!